UK’s Award-Winning Sky Central Workplace Creator, Neil Usher Offers Inspiration in His Book, “The Elemental Workplace"
The workplace has been on a journey, from machine-like rows of desks in the 50s, to the private cubicles of the 70s and the tech-inspired co-working spaces of the 2000s. But workplaces aren’t just about configuration. In his debut book titled, “The Elemental Workplace: The 12 Elements for Creating a Fantastic Workplace for Everyone” (LID Publishing, 2018), change management expert Neil Usher argues that an engaging and motivating workplace goes well beyond mere desk configuration; more holistically, it’s about creating a positive environment in which all employees can live, learn, grow, share, and contribute. Weaving insightful facts with lively prose and a sharp humor, Usher demystifies workplace design, breaking it down to the essentials, disentangling it from arguments solely about aesthetics and style. Drawing on more than 25 years in the property profession (strategy, development, transactions, workplace creation, change programs, capital projects, operational management), Usher has penned the ultimate handbook for anyone involved in office design, whether managing a property portfolio, running a business, or just interested in the workplace in which they are treated. 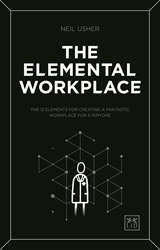 “The Elemental Workplace” is available for pre-order on Amazon, Barnes & Noble, and IndieBound (retail price: $19.95) and will be released for sale in the US on June 5, 2018.